Woah…Free Boat Ride for 15! Now, who are we going to pick!? The Buffalo Bisons have teamed up with Buffalo Cycleboats to get you on the water for one of the most unique parties in town! 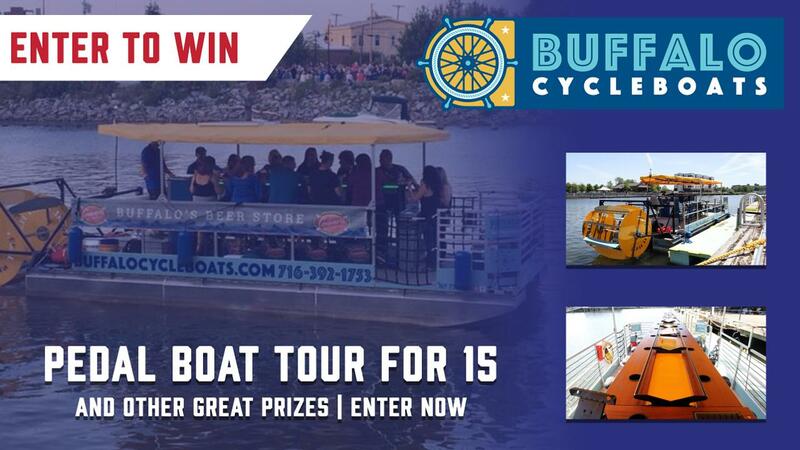 Enter now (below) or when you're at your next Bisons game at Coca-Cola Field for your chance to WIN a Buffalo CycleBoat Pedal Party Boat Tour for 15 people on Western New York's first and only human-powered CycleBoat. You and your guests will cruise on the waters of the Buffalo River and through Downtown Buffalo's Canalside area, pedaling as you party! Prizes for individual cruises as well as gift certificates will also be awarded.Just enter the form below by August 1st to be eligible to win! Buffalo CycleBoats WNY's first and only human-powered CycleBoat! We are a perfect unique boating experience for any occasion! Whether you call us a BOAT, call us a BIKE, or call us a FLOATING PEDAL PUB, one thing you will call us is unforgettable! Come aboard our 15 passenger boat, pedal, relax and enjoy the scenic Downtown Buffalo waterways. For more information, or to book your next Buffalo CycleBoat tour, visit buffalocycleboats.com.